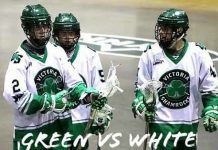 The Victoria Junior Shamrock’s Green vs White head to head scrimmage held on Tuesday night was a well-attended event. The coaching staff and GM sat isolated down at one end of the stands discussing the tough decisions they were going to have to make while spectators watched the players play their hearts out to earn a position on the one of the two Junior Shamrock teams. The British Columbia Junior Lacrosse League eliminated the Intermediate A level and made junior lacrosse a 5-year Program with there now being a Junior B Tier 1 and a Junior A team. The inaugural year for these changes was last season. This change means that a graduating midget player could if deemed worthy play on a Junior A team right out of midget. On Tuesday evening the teams were made up of players who had played all different levels of lacrosse the previous year. There were previous Junior A, Junior B Tier 1, Junior B Tier 2 and graduated midget players playing hard to keep or earn a spot on one of the two Victoria Shamrock Junior Teams. The spectators witnessed some good lacrosse with a few squirmishes thrown in to liven things up. The game ended in a 5-5 tie. The coaches now have to base on previous tryouts and the scrimmage make the first round of cuts. The Victoria Junior Shamrocks season opens at home with the Tier 1’s playing on April 27th at home at the Q-Centre at 1:00pm vs Burnaby and the Junior A’s first home game on May 4th at the Q-Centre at 1:00 pm. Previous articleJust Griffen Outhouse -Thank You ! !